Last year my sister-in-law gave my mother-in-law the best hand soap. While I thoroughly enjoyed their company over the holiday break, I couldn't help myself from sneaking into the bathroom any chance I got to get a whiff of this deliciousness. Even now when I wash my hands, I can't stop from smelling them constantly. Such a weirdo move, right? Just call me Mary Katherine Gallagher. By the time I made it out to the store last year, this seasonal item was already sold out! What?! I know. 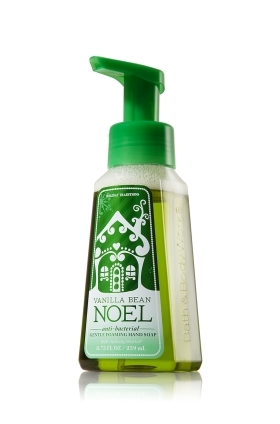 So I was frequently checking the Bath & Body Works website this year to see when their Christmas scents were coming in. It just so happens that when I checked the site when I had those 2 days off and was going to the mall - my scent was in! I only bought 4. A hoarder? I don't think so.... not really... This foam one doesn't really moisturize, but they do have a moisturizing soap and one that exfoliates! I bought one of each of those as well. :) It's probably a scent you can enjoy year round, especially if you love 'nilla.